Coinciding with a buck wild, self-published “op-ed,” Governor Andrew Cuomo went on WNYC’s The Brian Lehrer Show this morning to double down on his decision to offer Amazon, one of the largest retailers in the world, a glut of incentives estimated to total $4.6 billion. The interview was a rousing success—if his intention was to make irate New Yorkers even more furious about a massive corporate handout. One of the biggest concerns for residents of the city, and Queens in particular, will be the impact a large number of highly-paid tech workers will have on housing prices, subway congestion, and other currently strained municipal services. “We have done that math roughly” Cuomo, who jokingly offered to change his first name to “Amazon” to secure the deal, told Lehrer. When pressed further he added, “We don’t have the full number—what would the 25,000 people require in police protection, fire protection—no.” One wonders how Cuomo is so quick to sell “the Amazon transaction” as a net positive when it seems the due diligence calculations still haven’t been completed. Cuomo also described the area around Vernon Boulevard that Amazon plans to occupy as “essentially a vacant piece of real estate in Long Island City that has sat there for decades.” Perhaps, but in the midst of what he has readily admitted is an affordable housing crisis, he conveniently failed to mention that the some of that plot of land was previously earmarked for affordable housing—about 1,500 units, according to Politico. Had Amazon made any promises about diversity and inclusion in its plans for these 25,000 prospective jobs, Lehrer asked? 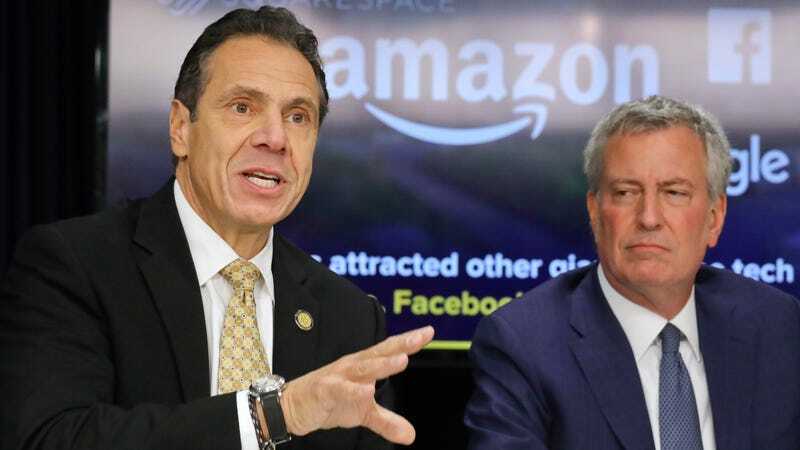 “Amazon has a good track record in that regard,” Cuomo said of a company recently that’s entire board is white, and which recently received backlash for building an AI hiring tool which systematically disadvantaged women. “I don’t believe that we have any specific additional conditions, but I’d have to check,” he added. All he would confirm in the scope of Amazon’s commitments to the people of New York were plans to partner with a nearby public housing complex to hire an unspecified number of people, and plans to build a tech incubator—which seems to serve Amazon’s interests a great deal more than the residents of Long Island City. This boondoggle will forever be associated with Amazon Cuomo’s administration, though he’ll be out of office long before its worst effects are felt. There was one thing Cuomo got right in his op-ed (a point he regurgitated in this morning’s interview): “One could argue that in a perfect world no city or state would be legally allowed to offer incentives and there would be no competition for individuals or businesses,” he wrote, as though the sickening displays of prostration for Amazon jobs caused him to lose any sleep. One could also argue that in a perfect world New York would have a better governor than Andrew “Amazon” Cuomo.